Jalapeno peppers are the food of the brave. The heat of a jalapeno can add a kick to food but a lasting burn to your skin. Although these burns do dissipate on their own, the experience can range from uncomfortable to extremely painful, particularly with certain varieties of pepper. Always take care when cooking with jalapenos and never touch your eyes after you have handled them. Capsaicin, the burning agent in jalapeno peppers, is also an ingredient in pepper spray and animal repellent. Direct exposure to the capsaicin in jalapenos can cause a condition known as "Hunan Hand," which, according to the National Pesticide Information Center, is a type of contact dermatitis often seen amongst people who regularly touch jalapenos. The website, “The Chile Man,” explains that "Hunan Hand" is sometimes called "Chile Willy." The condition is attributed to a Chicago man who required hospital treatment after cooking a Hunan Chinese meal involving hot peppers. Besides adding heat to your curry, capsaicin also has medical benefits when applied directly to the skin. According to EdInformatics, it is an ingredient in creams, ointments, and bandages. While the medical professional wears rubber gloves and a face mask, the patient receives the treatment directly on the skin. This treatment is often used on areas afflicted by shingles, muscle pains, or arthritis. As soon as the patient feels a burning sensation, the cream is removed. The capsaicin prevents the nerves from transmitting pain, thus alleviating discomfort. Jalapeno peppers and byproducts can all cause skin burns. This includes dried jalapenos, fresh jalapenos, jams, jellies, chutneys, hot sauce and paste. The peppers themselves can be green or red, with red tending to taste sweeter. All peppers and products will have varying levels of heat, which will affect the severity of the burn you may experience. Always wear rubber gloves when you are working with jalapenos, as this should prevent skin burns. According to the website, Jalapeno Madness, dairy products are excellent for combating jalapeno burns. First, apply rubbing alcohol to the burn site; this removes the oil. Afterward, immerse the burn in milk or apply a milk-soaked washcloth to the burn. The chemical casein in dairy products removes the jalapeno burn from the skin. If no milk is available, gently wash the burn with soap and warm water. Apply olive oil for one minute, then wash it off. Not all jalapenos are dangerously hot. Jalapeno Madness explains that jalapenos are measured in Scoville units to determine their heat factor. Each pepper is given a number, ranging from zero for bell peppers to 855,000 for India’s Naga Jolokia pepper, though specific measurements may vary. Jalapenos generally fall between 2,500 to 8,000 on the Scoville scale. 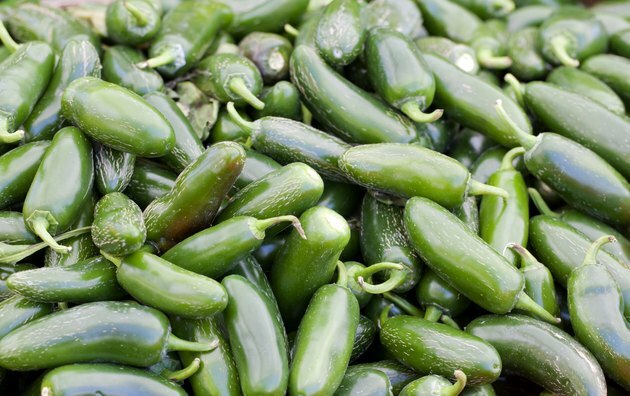 Jalapenos that grow in areas that have hotter temperatures or lack water typically yield a higher burn factor. Beware of jalapenos with vein-covered skin, as these tend to be hotter than those without. The Chile Man: Guide: What makes Chiles Hot?